Father's Day is "just around the corner" and the kids are "gearing up" to "have a ball" with their daddy. Daddy may think he is "the big cheese" around here but my daughter pretty much has him "wrapped around her little finger" and my son is certainly "a chip off the old block" and likes "the limelight" as well. "Get the picture?" Dad's day probably won't be just about Dad but hopefully he'll be "pleased as punch" at our efforts to make him feel special. Yes, we plan to "pull out all the stops" and "roll out the red carpet" as well. Lucky for him, we'll keep the idioms and figures of speech to a minimum. 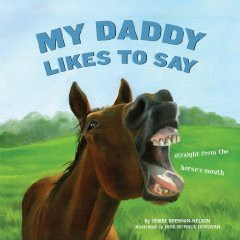 The children's book My Daddy Likes to Say is a fun take on familiar idioms a dad might say to his children. Using poetry and side notes, author Denise Brennan-Nelson explains phrases like "fly by the seat of your pants" and "were you born in a barn?" The silly illustrations by Jane Monroe Donovan help show literal representations of the expressions. Each page spread features an idiom, a poem pertaining the idiom, factual information and an accompanying illustration. The book is the fourth in the "Likes to Say" idiom series: My Momma Likes to Say, My Teacher Likes to Say, and My Grandma Likes to Say. My preschool aged daughter is too young to completely understand idioms, but she does enjoy looking at the humorous pictures in the book. She also likes the short, rhyming poems that go along with each of the idioms featured in the book. Elementary school aged children will enjoy reading about the origins and meanings behind the phrases. Just like the other books in the award-winning series, this book would make an excellent teaching tool for homeschoolers and teachers interested in presenting a lesson on idioms. Sleeping Bear Press has kindly offered to give away (3) copies of My Daddy Likes to Say to Brimful Curiosities readers. • Contest ends on Monday, June 29th, 2009 at 11:59 PM CST. One I can think of: A Leopard can't change his spots! Please enter me so I can think of more! This sounds like the bee's knees! Well, "for goodness' sake" what a great giveaway! Rub someone the wrong way. Thank you! I always remember learning idioms in Spanish and how funny it was. My favorite was "en una boca cerrada no entran moscas" which meant "Silence is golden," but literally translated to "in a closed mouth, flies do not enter." What a great book! My daughter would love this! How about "the early bird gets the worm" :) Thanks for the chance! I'm a southern gal, "A gracious plenty..."
The first one I can think of is "once bitten, twice shy"
Yada Yada Yada is a favorite of mine. Thanks for the wonderful giveaway. I love these! I ALWAYS get them wrong, so I am not going to write one down. Wish I could follow you in Twitter, but I don't have an account, and I don't think I can manage another medium for social networking! I can't think of a good idiom, so I would just like to say that your giveaway is great and if I win, I'll be giving this cute book to my niece! She will LOVE it. Also, I have a giveaway at the moment on my food blog, too! It's a big bag of goodies and samples from the Food Expo I attended last week. Check out the site for more details! I always liked "A Bird In The Hand Is Worth Two In The Bush"
My favorite's always been "How bout them apples" :). A penny for your thoughts seems to be a popular one around here. "There are many fishes in the sea". "Curiosity killed the cat" and "Barking up the wrong tree"
One of my favorites that I remember the most is "What's that got to do with the price of tea in China?" How about - Sleeping like a baby or Soft as a baby's bottom. Come Next Monday! Thanks for the chance for this book. Followed on Twitter (stiletostrytime). "Do as I say, not as I do"....I have to follow Linda with that one. Not sure it counts but perhaps "backseat drivier". I'll have a real "chip on my shoulder" if I don't win this book! And I'll be "in a pickle" because I'll have to try and win it from another blog! "keep your eyes peeled" My Gmother use to always say! Id love this book! This will "soften the blow." My kids are pushing me "over the edge"! I think my daughter "got up on the wrong side of the bed", lol. Thanks for the awesome giveaway! I would be thrilled to win a copy! "Snug as a bug in a rug" - that's where I wish I was right now!